Component The User Input Control component allows you to select from three different options: a Text Field, Drop-down list, and Date Picker. Key Features Set the scope of the component to Dashboard, Klip, or All Dashboards. Use a Text Field to search for values directly on your dashboard. 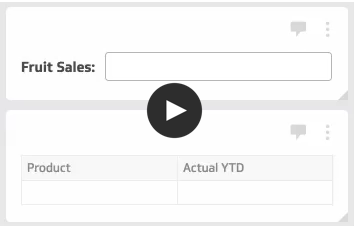 Use a Drop-down list to select which values to show on your dashboard. Use a Date Picker to select a date range. In order for the User Input Control component to work, you need to set variables. You can filter your visualization based on a variable. See Filter on variables. Filter, Group, Aggregate and Sort Filter, group, aggregate and sort your visualization without the use of formulas. Using the More Actions menu allows you to apply these actions directly in your visualization. See the More Actions article to learn how to use these actions with elements of your components and Hidden Data. The User Input Control component allows you to control your dashboard display according to variables assigned to that component. The most important thing to know about the User Input Control component is that it sets the value of a variable. Choose the Control Type in the Properties panel. Date picker: allows you to select start and end dates. Text field: allows you to type in a term and works like a search function. Drop-down list: provides a list of values to select from. Values: The list of possible values to be assigned to the variable associated with the drop-down List. Labels: You have the option to display values with an overriding label rather than the original value name. For example, if Values are a list of employee numbers (used to index into a data source), the Labels may be the corresponding employee names which are easier for a user to select. If Labels are specified, the number of Labels must be the same as the number of Values. To assign the variable that the User Input Control component will set. Select a variable from the Use Variable option. Optional: Provide a default value for the component to use. The default value is used the first time the Klip is viewed in a dashboard. Once you select a different value, the most recent selection is retained. The first value in the drop-down list is used as the default if a default value is not set. To learn more about variables, see how to use variables. Scope sets the level your User Input Control component will control: Klip, Dashboard or All Dashboards. Only Klips that use variables are affected. you must perform the following steps to reset the variable controls. Close the dashboard by hiding it from the active list. To do this, click the active dashboard's 3-dot menu and select Hide from list. Add the dashboard you closed in step 1 back to your active list. To do this, click Dashboards, locate the dashboard, and click the Open dashboard button. A User Input Control component with Scope set to Klip will control the values displayed on Klips (using its variable) in the same multicomponent Klip as the User Input Control component. A User Input Control component with Scope set to Dashboard will control the values displayed on Klips (using its variable) on the same dashboard as the User Input Control component. 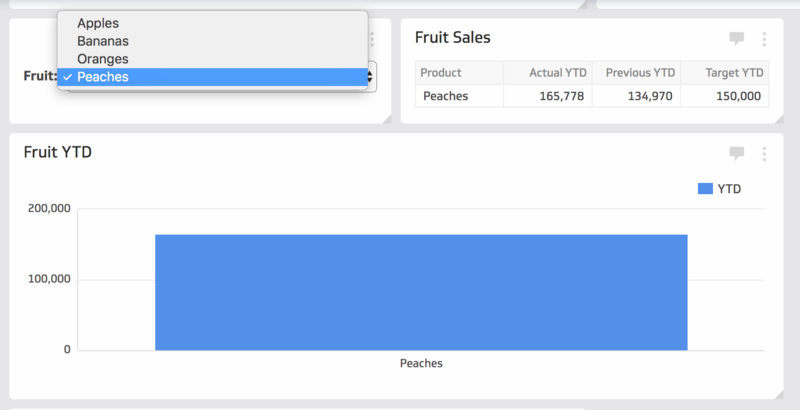 A User Input Control component with Scope set to All Dashboards will control the values displayed on Klips (using its variable) on all dashboards. You have the option to set the visibility of your User Input Control component in the Properties panel. 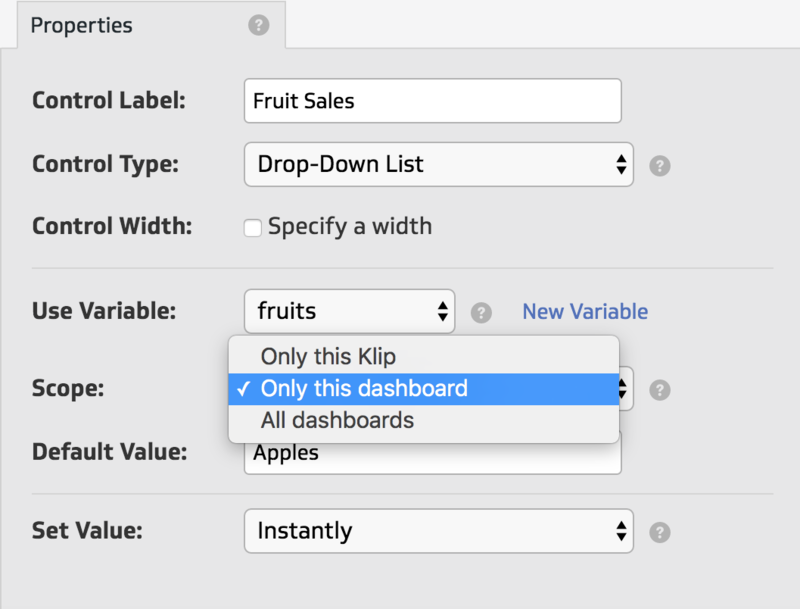 This option allows you to hide your User Input Control on your dashboard and still change the settings for it in the Klip Editor. This feature also allows you to set User Input Controls to Hide when scope overridden. 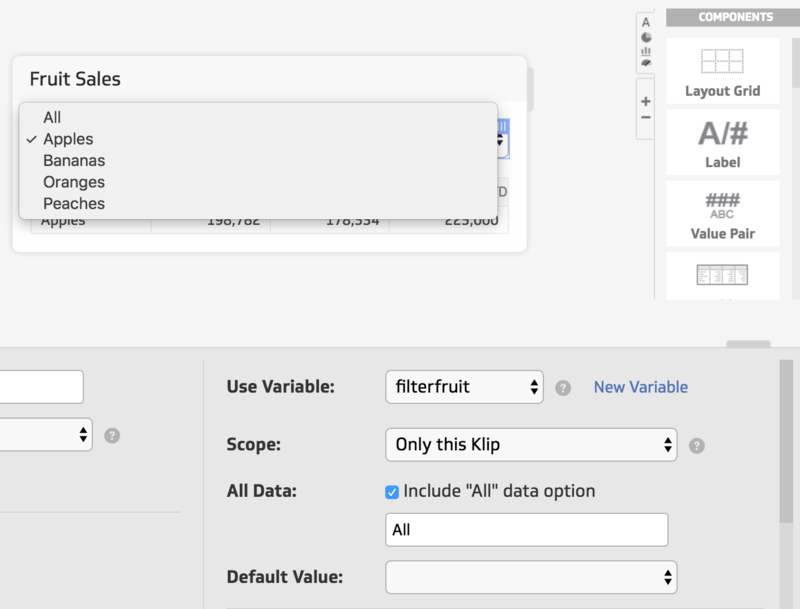 This means that if another User Input Control with a larger scope (Only this dashboard scope or All dashboards scope) and the same variable is causing Klips on that dashboard to react, the User Input Controls with the visibility setting will be hidden so Klips are only reacting to one control. This option is available when the Scope is set to Only this Klip. The Values sub-component provides values, typically through a data source. The value selected from the drop-down list is the value that is assigned to the variable. Select the Values sub-component of the User Input Control component from the Component Tree. Select the column of data (A:A) you want to assign as your drop-down options. Use the Filter action to set a condition that filters out the column header from the Values sub-component of the User Input Control component. You can add an All option to the drop-down list: check Include "All" data option on the Properties panel of the User Input Control component. Note: Just like $ references a variable in a formula, "_all_" references the All option in a formula. See SELECT to see how to use conditions with All in a formula. Watch this video to see an example of using Filter and a User Input Control.